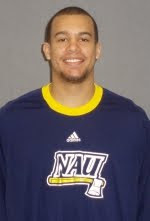 Big Sky Basketball: How Will Northern Arizona Replace Cameron Jones? Since we have already looked at the departing stars at Montana, Northern Colorado, and Idaho St., let's move on to Northern Arizona. Northern Arizona was on the cusp of things last year, winning 19 games (respectable) and finishing 9-7 in the Big Sky. But it could be tougher to replicate that mark this year, as their top player and First Team All Big Sky performer Cameron Jones has exhausted his eligibility after a stellar career in Flagstaff. Jones will be difficult to replace not only because he was an excellent Big Sky player, but because he was such a massive part of the offense. Jones used 31.5% of the team's possessions (18th in the nation) and took 37.6% of the team's shots a season, 2nd in the NCAA (behind some guy named Jimmer). The good thing is that he was pretty efficient with those possessions. He got to the line 133 times and shot 80%, was 47% from 2s, and shot an impressive 41% from downtown (albeit on a relatively small 91 shots). He also shined as a distributor, as he had a solid 22.0 ARate and a 12.8 TO Rate, which any coach will take from their shooting guard. Add it up, and he will be sorely missed by Coach Mike Adras. So how will they replace him? More of the ballhandling duties will fall to Gabe Rogers, who was pretty impressive in his own right as a sophomore. Rogers was second on the team with 13 PPG, but he was a different scorer than Jones. Rogers shot only 40% from 2s, and didn't get to the line too often, but he was dynamite from downtown, shooting 46.8% from beyond the arc (helping make NAU the 2nd best 3-point shooting team in the country. However, they will need him to diversify his scoring some if he is going to take the next step and become their star. After Rogers, there are some questions about who will get the minutes to replace Jones. One holdover from last year is Durrell Norman, who had a moderately limited role in his junior year. Curiously, as 6'4'' he had an OR% of 11.7, which was 4th in the Big Sky conference. He will get some run as a senior. Another guy who should factor for minutes is freshman Danny Cheek, who could be the best incoming recruit in the Big Sky. He is a great athlete, attacks the rim offensively, and has solid potential on the defensive end. Don't forget his name if you are a Big Sky fan, you will be hearing it a lot over the next 4 years. Very excited to see what he can do. Another contender are transfer Jywrell Wilson, who should have a role after coming over from Seattle via a smaller conference school. He is a very solid all-around talent that comes in seasoned. So the Lumberjacks do lose Jones, one of the most potent players in the Big Sky, but they should have the talent level to replace much of his production. How far they come might depend on the development of Danny Cheek. It will be an interesting transition year for Mike Adras, who should have a pretty young team after losing 4 key contributors from last season. How do you all see them replacing Cameron Jones?